Workshop Sheds - Who Has The Best Workshop Sheds? Workshop sheds are among the most useful, and versatile, garden buildings of them all. They make a great place to keep gardening tools and equipment, of course, but thanks to their size they can be used for a whole lot more as well. 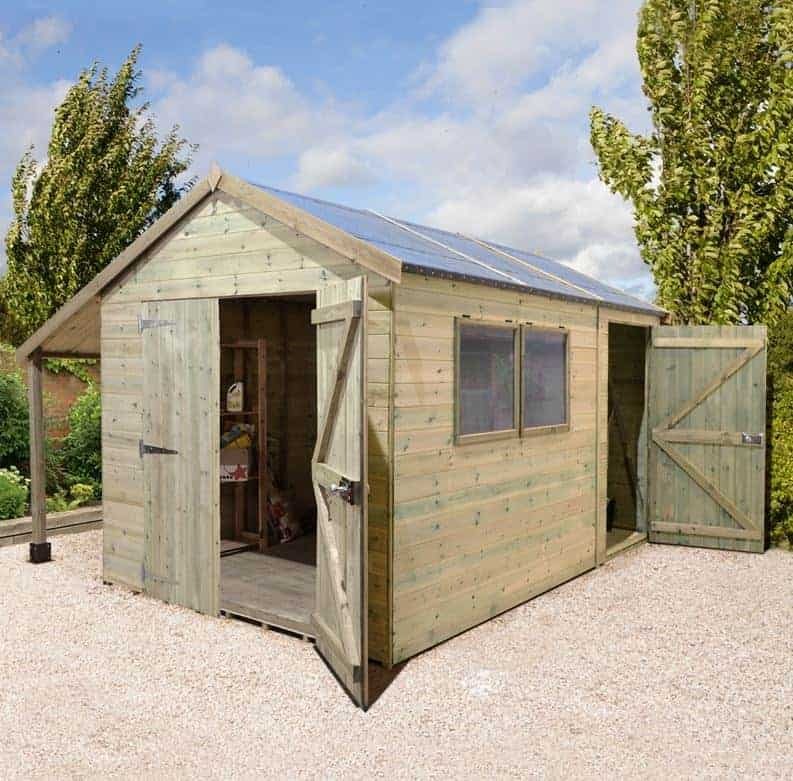 Well built workshop sheds provide a comfortable environment to pursue a hobby, such as woodwork or crafting, but they can also act as a cost effective base for a home run business. It’s little wonder that they are becoming ever more popular, which is why we’ve created this handy WhatShed guide to the 20 best workshop sheds that can be bought online in the UK today. There were a lot of workshop sheds to choose from, but as we are looking at garden buildings that could be used as either a workshop or a garden shed we’ve only considered those buildings with a minimum size of 8 x 8 and a maximum size of 10 x 15, and we’ve not included log cabins or loglap clad buildings either. 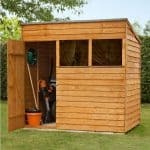 We’ve then considered the price and overall value of each workshop shed we’ve reviewed, as well as its aesthetic appeal, and any additional features that can give the customer extra value for money. Workshop sheds come in many different styles, and in all substrates, but our guide should have something everybody and covers all prices. 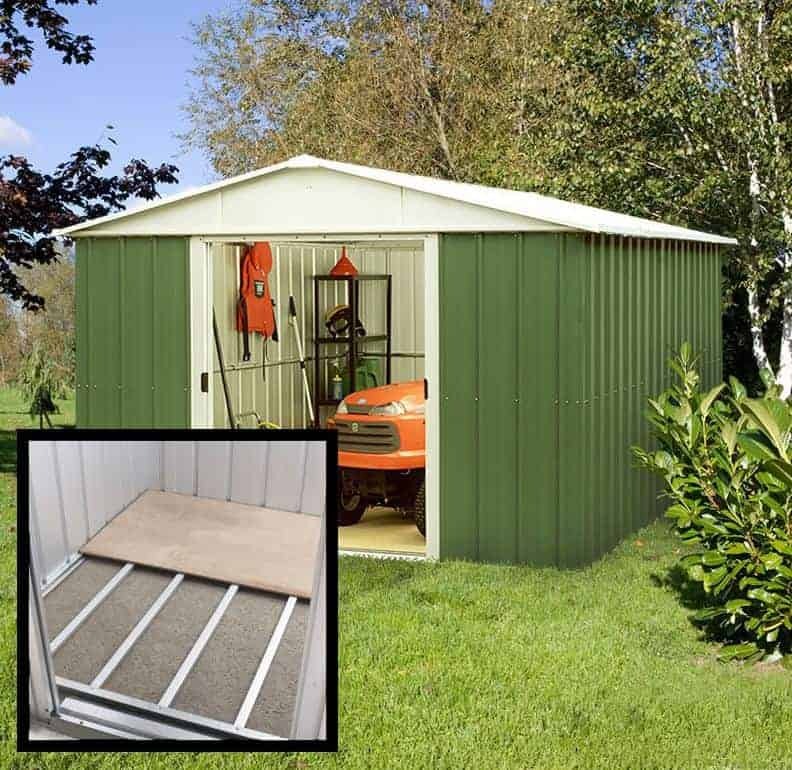 In such a competitive category, it’s well done to Shed-Plus Champion Heavy Duty Combination workshop shed, which takes the top spot not by being the cheapest, but by offering added value in the form of the secure storage area, and by being very durable, well built, and good looking too. Whether you want a large workshop, a small garden shed, or anything in between, WhatShed will bring you the reviews that can help you make a perfect purchasing decision. When compiling our WhatShed league tables, we like to include garden buildings to suit all budgets, and therefore we always appreciate value for money. 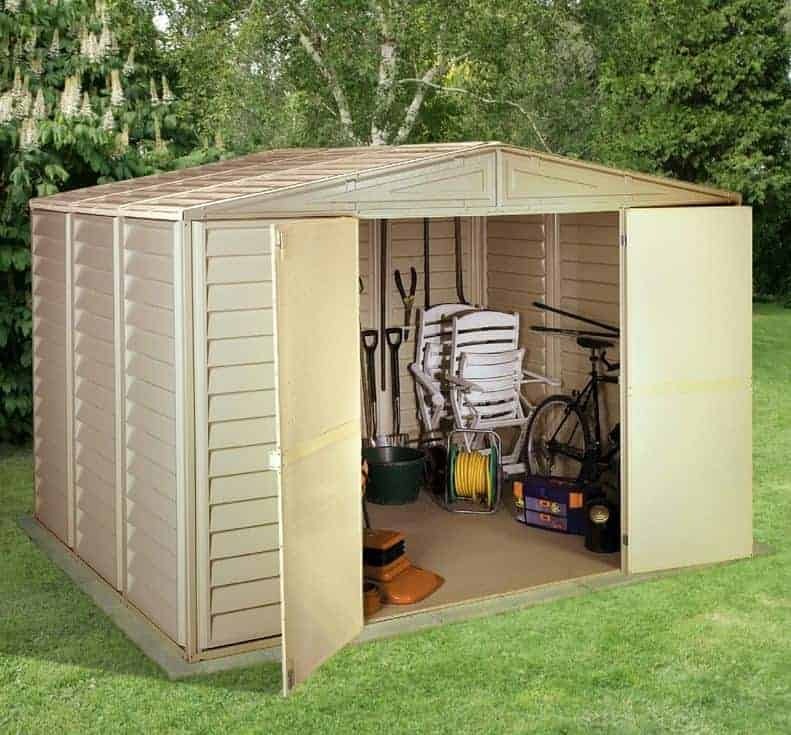 That doesn’t necessarily mean that the cheapest sheds will always come out on top, however, as shown by this heavy duty combination shed that takes top place in our list of the 20 best workshop sheds, despite a price tag of over thirteen hundred pounds. When you consider its versatility, thanks to an integrated secure storage area, and its durability, however, there was no doubt in out mind that this still represents very good value for money, and fully deserves the top spot. In effect, this is two garden buildings in one, within a twelve foot by eight foot base area. The majority of this building is a high quality workshop, with tongue and groove cladding used throughout and accessed via wide opening double doors that take up most of the frontage. This area is served by two windows, making it easy to see what you’re doing. At the rear is a secure storage area that is served by its own personnel door, and as there are no windows it’s impossible for others to see what ‘s being kept inside. It’s a unique feature among the workshop sheds we’ve reviewed, and we were pleased to see that all doors have key operated locks to make them even more secure. Another positive feature that helped this rise to the top of the league table is that all the timber has been pressure treated, and is covered by a 15 year guarantee. Most of the wooden workshop sheds featured within our league table have shiplap tongue and groove cladding, which is noted for giving excellent strength and stability. This Hartwood shed, however, uses overlap cladding, but it still takes the runner up position in our league table by offering superb value for money. Even though the cladding is noticeably thinner than that we see on tongue and groove workshop sheds, it will still feel stable and reliable once fully assembled, and we were very pleased to see that the timber has been pressure treated by the manufacturer. Not only does this give a 15 year guarantee, which is something we’re always happy to see, but it also means that the customer can save time and money by not having to re-treat it with wood preserver every year. It’s one of the larger workshop sheds in our list, with a width of 2.46m and a generous depth of 3.72m, and yet we found that every part of the interior is illuminated on a sunny day thanks to a bank of six windows that run down the full length of one side. Polycarbonate glazing is used, which once again helps to keep the price down for the customer, and this means that the windows are not only functional they are also extremely shatter resistant. 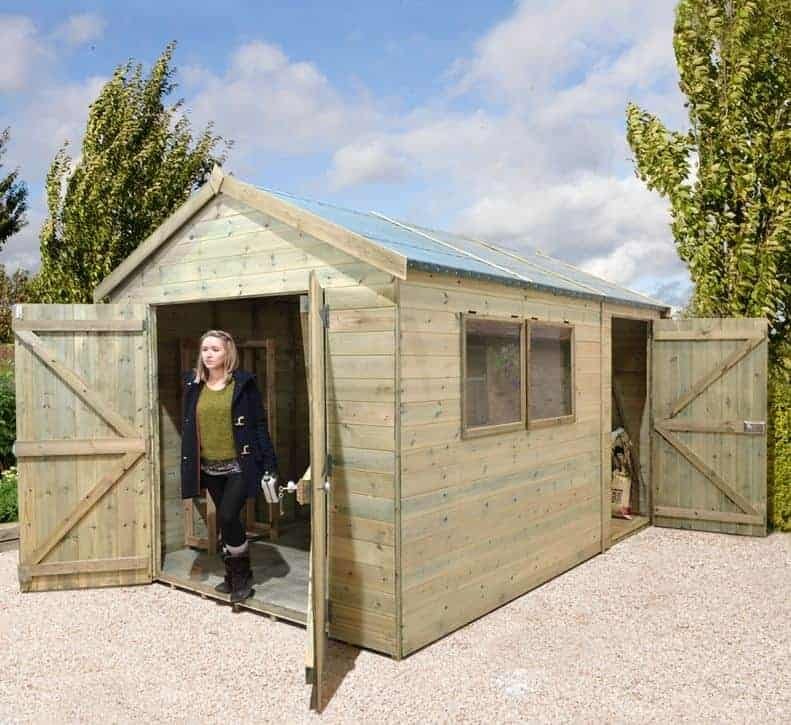 This is the largest of all the workshop sheds that feature within our league table, and yet with a 3.07 x 4.64 base area it’s still suitable for medium sized domestic gardens where space is precious. This makes it an ideal proposition not only for those who want a good sized garden shed, but also those who want a large garden building that can be used as a home office, warehouse or even small scale manufacturing unit for a home run business. 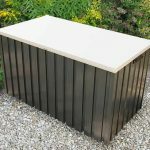 With all these possibilities it also represents outstanding value for money, especially as it comes with a 20 year manufacturer’s guarantee which is longer than that on any other workshop shed that we’ve reviewed. The reason that such a long warranty period can be given is that unlike the majority of the sheds in this league table it’s made of metal rather than wood, and is therefore very strong and durable and of course immune from the threat of rot. 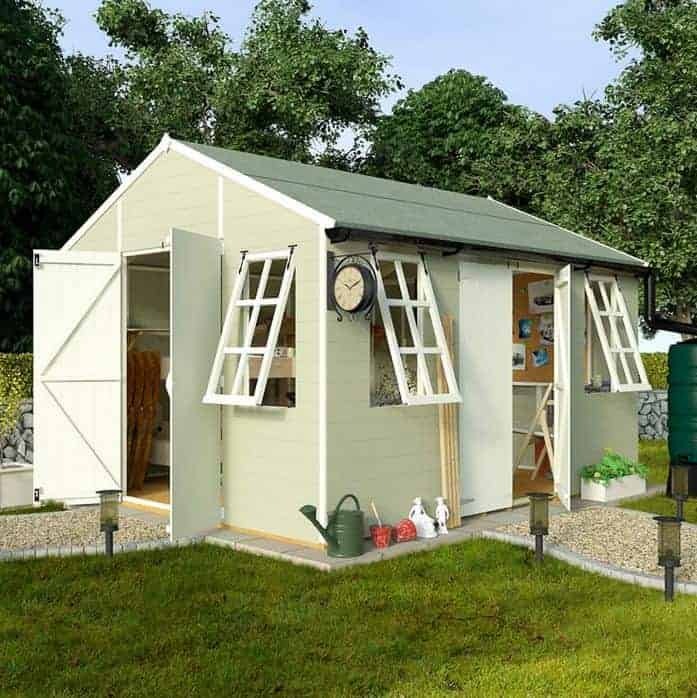 We know that many people prefer the look of timber workshop sheds, and this is the only thing preventing this model from claiming the top position, but we found it quite attractive thanks to its subtle green and white colour scheme. We also liked its very tall eaves height, 2.25m, and the two sets of doors it has, making it easy to move items in and out. 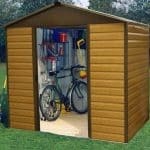 The best workshop sheds are tough and durable buildings that can be utilised all year round, year in and year out. 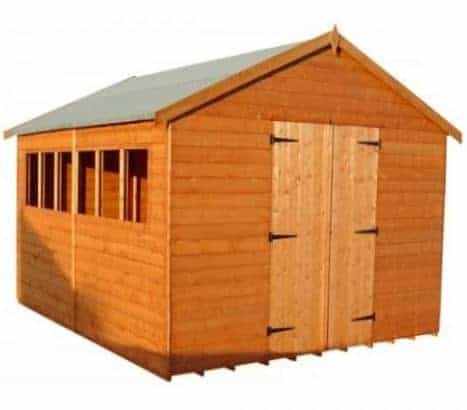 That’s certainly what this Shed Republic model offers, and as it also offers very good value for money, at less than nine hundred pounds for a base area of ten feet by eight feet, it deserves a place in the upper echelons of our league table. We were glad to find that strong tongue and groove cladding has been used throughout, as in conjunction with the apex roof it means that there’s no chance of water penetration reaching the goods inside. We were also pleased to find a 15 year warranty against rot, adding even more value. This is the single door version, although there is a double door version available for a little extra money. We feel that this will be more than adequate for most purposes, however, as the door has a height of 1.81m and a width of 0.89m making it the most accommodating single door of any of the workshop sheds we’ve seen. We were also glad to see that the two windows featured toughened glass and that they could both be opened, providing an easy and natural source of ventilation. This can be especially useful on a hot day of computer equipment, or other machinery, is being used inside. There are only two metal workshop sheds in our top twenty, which is a sign that this is very much a category where traditional timber buildings are favoured. That both of them feature in the top five, however, is an indicator of how tough metal sheds such as this are, and of the excellent value for money that they bring with them. As it doesn’t have any windows an artificial lighting source will need to be installed if this is to be used as a place to work in, but even allowing for this we are very impressed by an asking price of not much more than four hundred pounds for a strong and resilient ten by ten garden building. Indeed, so tough does this workshop shed feel once constructed that it could have had an even longer warranty period attached to it, even though the 12 years given here is still longer than we find on some similarly sized metal buildings. One thing we particularly liked was the inclusion of a floor support kit as standard. This allows the owner to install a wooden floor safe in the knowledge that it will be supported above ground level, and will therefore be protected from the threat of rising moisture which is often found at the surface of concrete or stone. Shiplap workshop sheds such as this not only provide excellent weather defences, being stable in windy conditions and with cladding that locks tightly together and therefore doesn’t let rainwater through, they can also look attractive and impressive. That certainly applies here, as we were impressed by the smooth planed exterior at first sight, and although this also represents very good value for money, which is one reason that it features so highly in our league table, nobody will ever guess how inexpensive it really is. The wide opening double doors are ideal if you want to transport wide or bulky machinery in and out, which is one of the reasons that we feel this would make such a convenient workshop facility for either work or leisure purposes. Whilst the floor joists have been pressure treated, which we were glad to see, the rest of the building has been given a dip treatment. 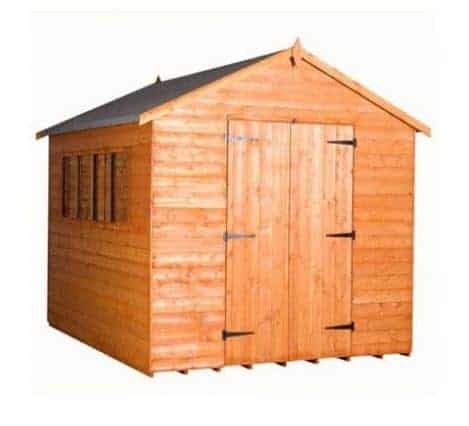 This means that although these workshop sheds include a 10 year warranty against rot this is dependent upon the owner carrying out annual preservative treatments. For this kind of money, however, we don’t find this surprising; nor are we surprised by the inclusion of solid sheet roofing and floors, cost effective solutions that have helped to keep the asking price low. 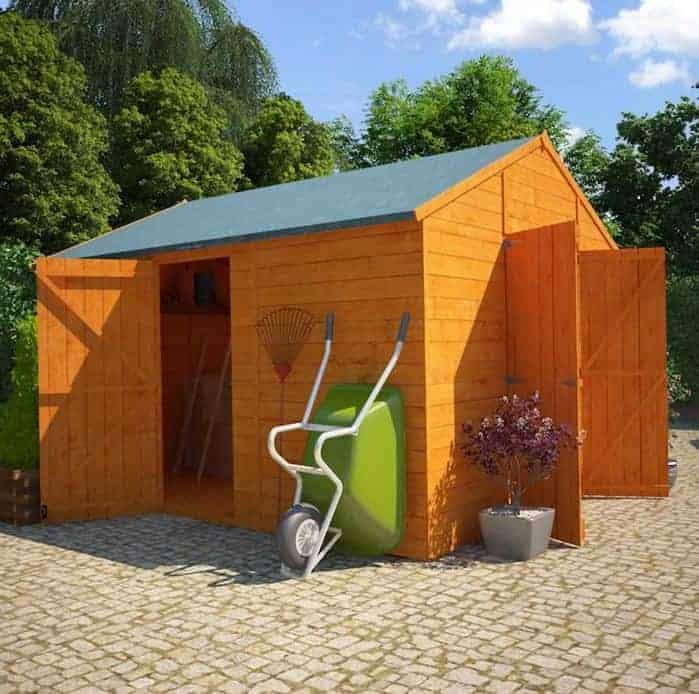 Workshop sheds can be seen as a hybrid garden building, large enough to be used to make things or to spend time in pursuing a hobby or work activity, and yet small enough to pass as an attractive and unobtrusive garden building. This is a great example of both of these properties. 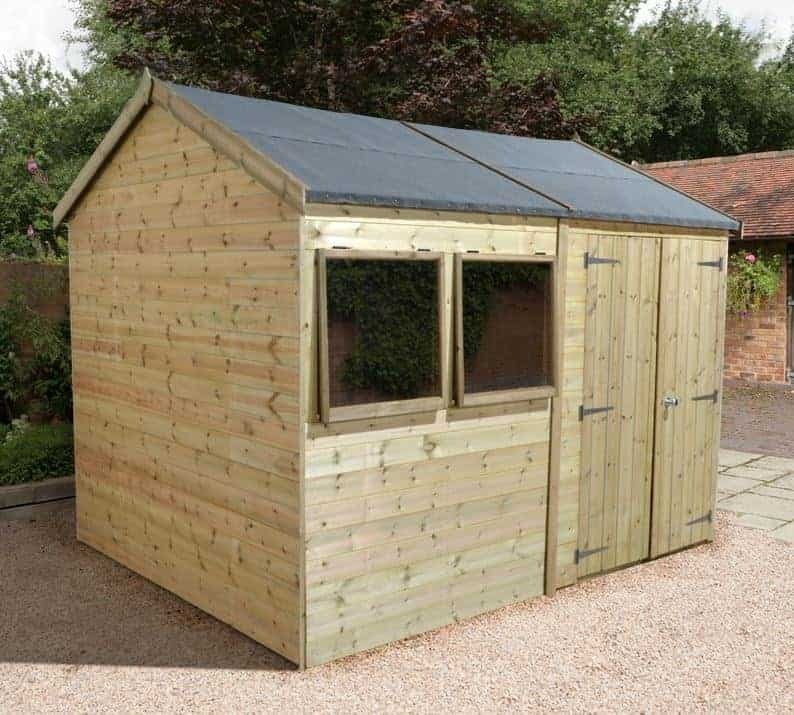 With a base size of 2.77 x 2.77m it’s easily large enough for garden storage purposes without taking over a medium sized lawn completely; and it’s also an ideal small scale workshop, thanks to the profusion of natural light created by its windows. This has more windows than any other of the similarly sized workshop sheds we’re reviewed, with six along one side and two on either side of the double hinged doors, all made of styrene. It was the first thing that grabbed our attention when we saw this building, and it creates a pleasant and welcoming interior that will be a comfortable place to work in, even for hours at a time. There’s a ten year warranty applied to the tongue and groove cladding as well, and if it had only been pressure treated, rather than dip treated, this could have gained a position even higher up our league table than it already does. 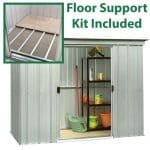 This comes from the same manufacturer that makes the model at the top of our league table of the 20 best workshop sheds that can be bought online in the UK today. This adds even more flexibility, however, but as it’s also smaller and significantly more expensive it achieves a lower overall position. What makes this stand out from all the other workshop sheds that we’ve reviewed is that it also features an integrated log store at the side. With increasing numbers of people burning logs for fuel we can see this being an extremely useful garden building to many, and so in this case the fifteen hundred pound price tag should actually prove to be reasonable value for money. Once again these particular workshop sheds feature a secure storage area that is served by its own single door but with no window allowing passers by to see into it. As it’s also secured by a key operated lock, this makes it an ideal place to store valuable tools, or even computer equipment that could then be used in the main body of the building that serves as a workshop or shed. We found the 15 year warranty against rot very reassuring as well, especially as it means that a long lasting pressure treatment has been applied across all of the timbers. As we’ve already seen, workshop sheds can vary greatly in cost, so just because their budget is tight doesn’t mean that a consumer has to do without the many benefits that they can bring. 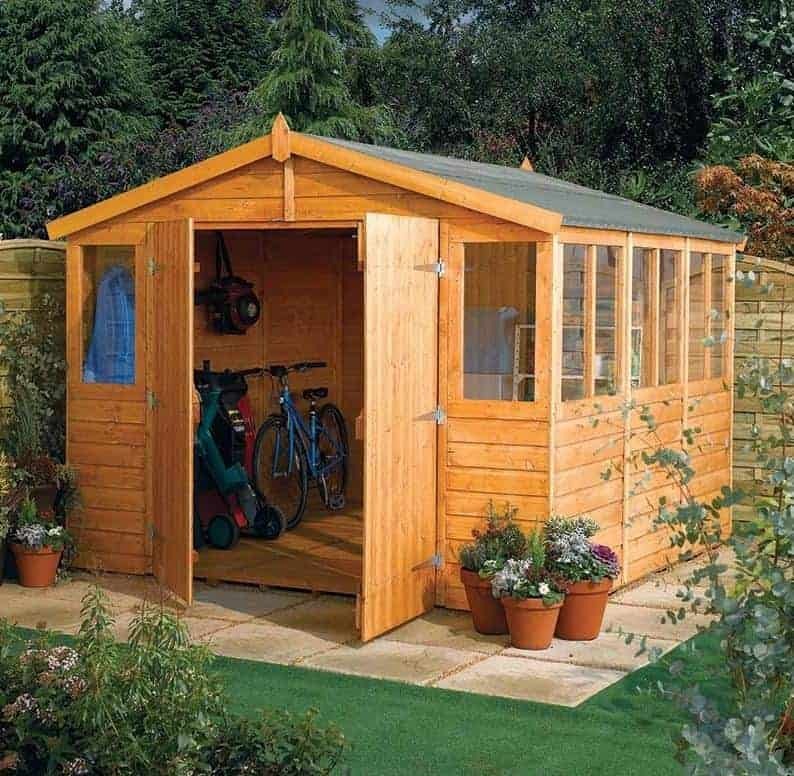 This Windsor workshop shed is the least expensive of all the timber workshop sheds in our top twenty league table, and it means that people can have a well built and reliable ten foot by eight foot garden building in their garden for not much more than four hundred pounds. 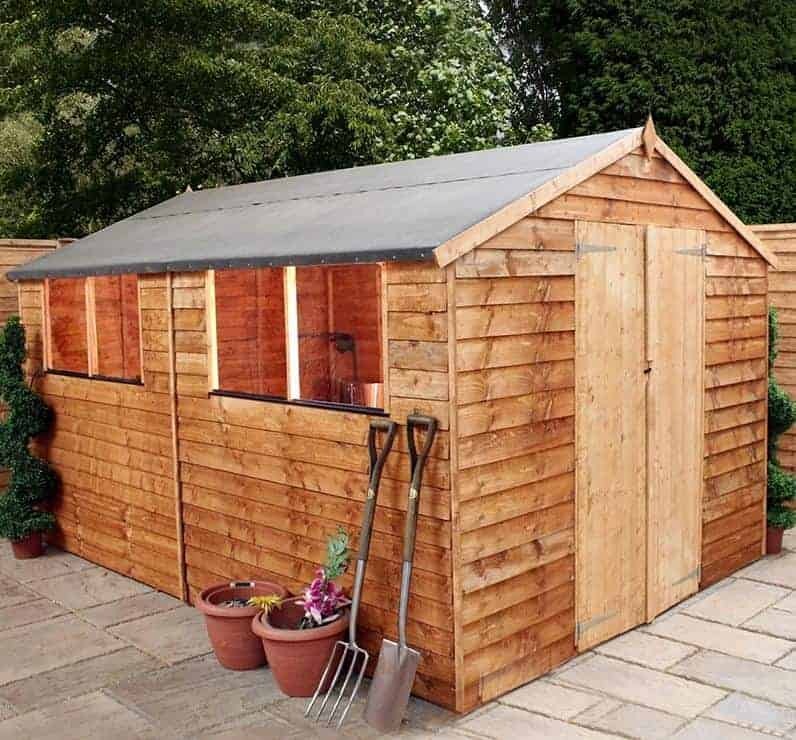 For those on a budget who only like the classic appearance of wooden sheds, therefore, this is certainly worthy of consideration. As is to be expected at this great value price, the manufacturer has adopted a number of money saving features. Foremost among these is the use of overlap, rather than tongue and groove cladding, for the walls, and solid sheet material for the roof and floor. Once installed, however, it doesn’t feel flimsy and so it shouldn’t have any problems with the British weather. A 10 year warranty is included against rot, and to help in this fight we were pleased to find that there were integrated floor joists that had been pressure treated to keep ground moisture out. 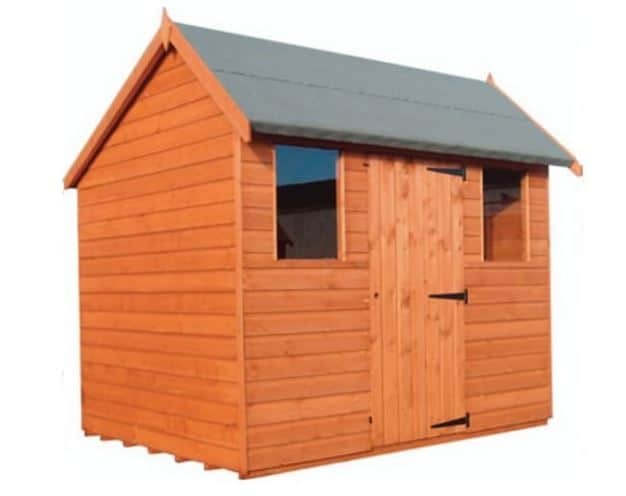 This may lack the sophistication of many of the wooden workshop sheds we see, but when it comes to the price it’s unbeatable. This is the first of the plastic workshop sheds to earn a place in our top twenty league table, and it brings with it benefits that you won’t find from either timber or metal sheds. Firstly they can’t rot or rust, and they are immune to insect attack. This also means that they are maintenance free, which will come as a relief to people who have become tired of applying extra coats of preserver to their wooden garden buildings every year. The manufacturer has livened up the ivory coloured cladding by arranging it in an overlap effect. We found this to be interesting and pleasing on the eye, but there’s no denying that this isn’t as attractive as many of the wooden workshop sheds we’ve reviewed, and this has been taken into consideration when determining the final placing. We were also a little disappointed to find that it only comes with a 10 year warranty, as the nature of the PVC substrate means that we feel it should last for much longer than this suggests. Nevertheless, it does still represent very good value for money, and we were pleased to see that a window could be added for an extra eighty pounds, which would then make it even more suitable for use as a workshop. Increasing numbers of people are working from home, and more people every day are setting up their own businesses. For these people, workshop sheds can prove a perfect low cost solution to where to carry out their work tasks free from the pressures and temptations of the home. We feel that this heavy duty workshop would be an ideal base for businesses of all kinds. Because all of the substrates are made from tough tongue and groove cladding, including the floor, it can take relatively heavy machinery without the need for reinforcements. We also feel that the two opening windows are a boon to people who are going to use machinery of any kind inside, providing cooling fresh air whenever needed. This is one of the toughest workshop sheds that we’ve reviewed not only because of the high quality cladding used throughout, but also because of the heavy duty framing that’s further supported by cross framing. Once assembled this is a workshop shed that should give very few problems whatever the weather throws at it, particularly as the wood has been pressure treated to push wood preserver deep into its fibres. This gives added value in the form of a 15 year guarantee against rot, making this good value for money considering its generous dimensions. 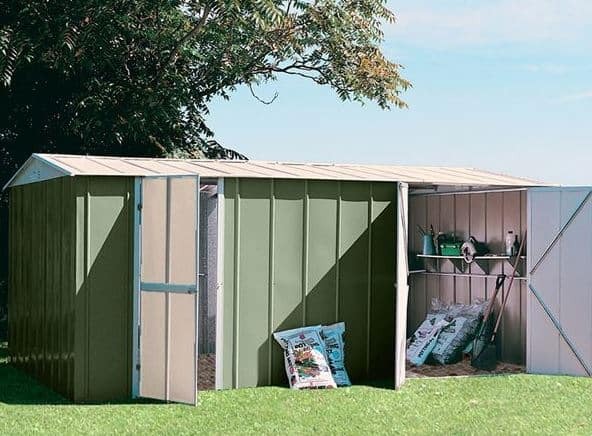 We’ve reviewed lots of BillyOh sheds in all sizes and styles, but these twelve foot by ten foot workshop sheds are among our favourites from their range. 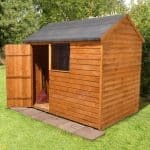 For a start, they’re among the most attractive medium to large sized garden buildings that we’ve seen. That’s partly thanks to the smooth and high quality tongue and groove cladding used throughout, and partly thanks to the four opening windows. They can not only all be opened, which is something that we think is especially important for a workshop environment, they are all designed in a Georgian style with a cross hatching. It’s a little touch but an effective one, and one that we found very pleasing to look at. We were also glad to see two sets of double doors, one set at the front and one on a side panel. That means that these workshop sheds could be used for a dual purpose, and a partition wall could even be erected to turn this into two reasonably sized rooms. It’s a value adding feature, but on the other hand it’s worth noting that a floor isn’t included as standard but has to be purchased as an optional extra. It’s this that prevents this otherwise excellent workshop shed from achieving a higher position within our league table. This is the fourth in the range of Champion heavy duty workshop sheds to gain a place in our WhatShed league table, which shows what a reliably excellent manufacturer they are. One again, this model has a character of its very own, including a reverse apex orientation that makes it ideal for shallow gardens. It’s also the second most expensive of all the workshop sheds in our list however, and that accounts for a position that’s considerably lower than it could otherwise achieve. If this falls within your budget, however, you may want to consider it before any of the others. 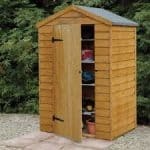 There is no log store on this occasion, nor any secure and window free storage area at the rear. What this does mean, however, is that the owner gets the full use of all of the twelve foot by ten foot interior space that these workshop sheds offer. They’ll also gain extras reassurance both from the key operated lock included as standard with the double doors, and the fifteen year manufacturer’s warranty provided. As the wood has been pressure treated there’s also no need to apply extra coats of wood preserver every year, and with a building of this size that can add up to a considerable saving of both time and money over the years. The ultimate workshop sheds from Mercia nearly live up to their name in price at least, as they are the third most expensive on their list. We were pleased to see, however, that they also nearly live up to this boast when it comes to performance too. If you live in a windy or exposed areas then you may be looking for a building that will prove stable and reliable even in tough conditions; in this case, this is definitely one that should be considered. From the first look at the pictures we could tell that this was a strong and durable building that’s been made to last. The shiplap cladding is 16mm thick, as opposed to the 12mm thick cladding that we more often see used on wooden tongue and groove workshop sheds. The framing was also noticeably thicker than average, and we were pleased to see that it featured chamfered edges that give it even more strength where it needs it most. Double doors are included, as well as two windows, and we were glad to see that the doors featured a key operated rim lock. At this price we would have liked to see a longer lasting preservative treatment, and a longer lasting warranty period, than the 10 years supplied here, however. These workshop sheds have a very pleasing blend of smooth planed tongue and groove timber and glazing, showing that serious and welcome consideration has been paid to the aesthetic appeal of the design as well as the functionality of it. It was the windows that first caught our eye as there are eight in total. We were pleased to find that while six of them are fixed in position, two of them can be opened and closed as required. This helps keep the price of the building as a whole down, which we know is an important consideration for many consumers, while still allowing easy and quick ventilation. Whilst tongue and groove cladding has been used for the walls, it has a thickness of 11mm, not the 12mm that we are used to seeing on workshop sheds made of timber. Although it may feel noticeably thinner during assembly, however, once it’s all pieced together it should still feel strong and stable. 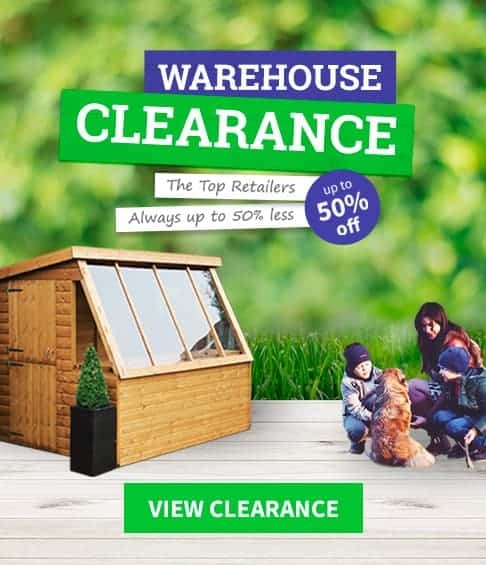 For a twelve foot by ten foot garden building, this represents very good value for money, but this is let down a little not only by the lack of a floor but also by the lack of an extended warranty of any kind. It’s this that keeps this workshop shed towards the lower reaches of our top twenty league table. As the name suggests, these workshop sheds are built with strength in mind, and we’re pleased to say that they deliver on that promise. Heavy duty shiplap cladding has been used throughout, and this will make them feel heavier than usual both during and after assembly. This makes it a perfect choice for people who want a shed that they can load up with heavy furniture, equipment and machinery. Because this is an ideal workshop to have machinery and equipment in, security is even more important than it usually is. That’s why we were glad to see that a key operated secure locking system was included as standard, although of course we wouldn’t discourage anyone from adding even more security in the form of alarms or CCTV. At eight foot by eight foot this is the smallest of the workshop sheds in our league table, and yet this makes it ideal for those with smaller gardens where available space is at a premium. It does feature an apex roof that gives eaves that are much higher than average as well, so it can be used to store tall items without any difficulty. If this workshop shed had been pressure treated, rather than dip treated, and came with an extended warranty period this could have been placed much further up our league table. This differs dramatically from the other BillyOh workshop sheds that we’ve reviewed in that it has a window free design, and indeed it’s the only wooden building in our league table to have no source of natural light. This brings both advantages and disadvantages. Those who want to use this primarily as a workshop, and who plan on spending extended periods of time inside, will need to install some form of artificial lighting. On the other hand, this is perfect for those who prize security above all other factors when it comes to their garden buildings. Because there are no windows to look into, passers by will be unable to tell whether anything valuable, or indeed anything at all, is being kept inside. This makes it much less likely, in our opinion, that it will be targeted by opportune thieves in search of easy pickings. Size wise this has a width of 3.14m and a depth of 3.56m, but we were particularly impressed by the ridge height of the apex roof at 2.48m. This means that there’s lots of room to move around in, and of course that means there’s also lots of storage space available. From a security and storage point of view, then, this has a lot going for it at a very reasonable price, but unfortunately the lack of an extended warranty and the lack of a floor as standard has again impacted upon the final position in this league table. These twelve foot by eight foot workshop sheds from Hipex have the classic apex roofed design that we always enjoy seeing, especially when high quality tongue and groove cladding is used throughout as in this case. 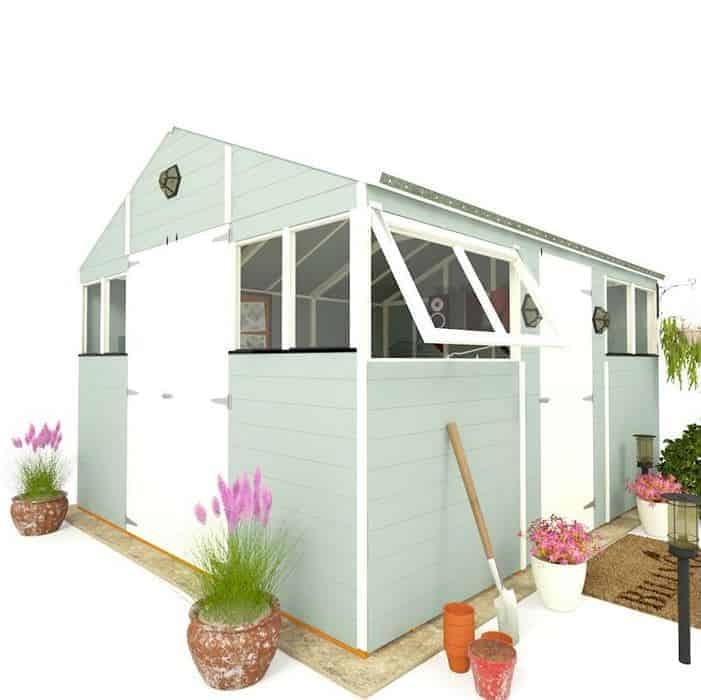 This could prove a popular choice with those who have traditional looking gardens and homes, and with two square windows on either side of the single hinged door it could easily be used as either a small scale workshop or as a garden storage shed. 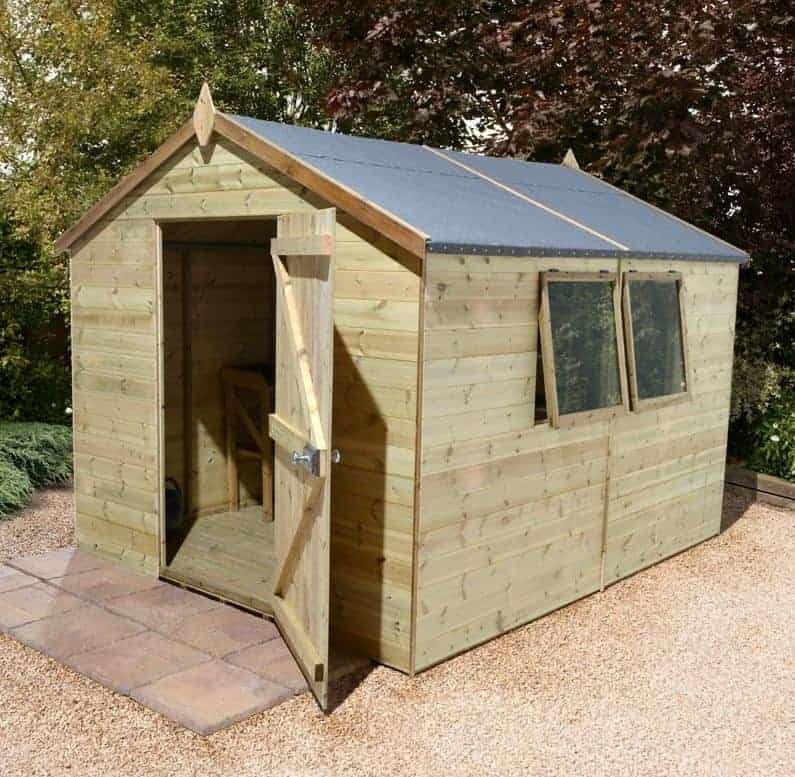 What we liked most about this model, and what helped it earn a place within our league table of the 20 best workshop sheds that can be bought online right now, is that it’s highly customisable to an extent that we rarely see. The customer can pay to have thicker cladding, or to upgrade tongue and groove timbers to loglap. They can also choose to have tanalised timbers, but it has to be said that we would have liked a pressure treatment to have been used anyway, and for a long warranty period to be provided. This, then, is an excellent choice for people who want to create a bespoke workshop shed, although the basic model is more expensive than many similarly sized garden buildings we’ve reviewed. This is the second of our top twenty workshop sheds to be made from a plastic substrate, and yet it’s very different stylistically. 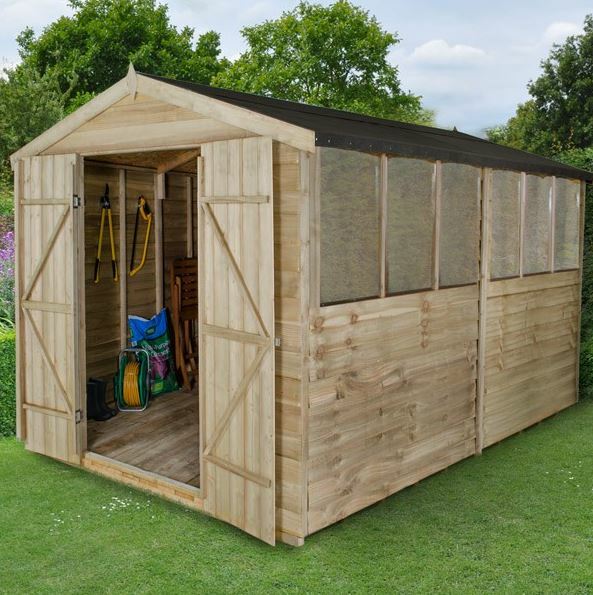 This takes the form of a traditional apex shed, with a width of 2.30m and a depth of 2.80m, and yet it brings some radical features that make it look very contemporary. For one, the polyethylene cladding is starkly white and it contrasts with the dark grey roof, arranged in a shingled pattern, and double doors. The doors themselves are arched at the top, although there’s still more than enough room when walking in or out. We found the overall effect striking, although we know that it won’t be to everyone’s taste. Another feature that we don’t often see in either plastic or metal workshop sheds is that there is a window in the side panel. It’s small and so doesn’t compromise security too much, and yet it still allows a good amount of natural light to reach the interior, especially as there are also five small skylights secreted in the roof. 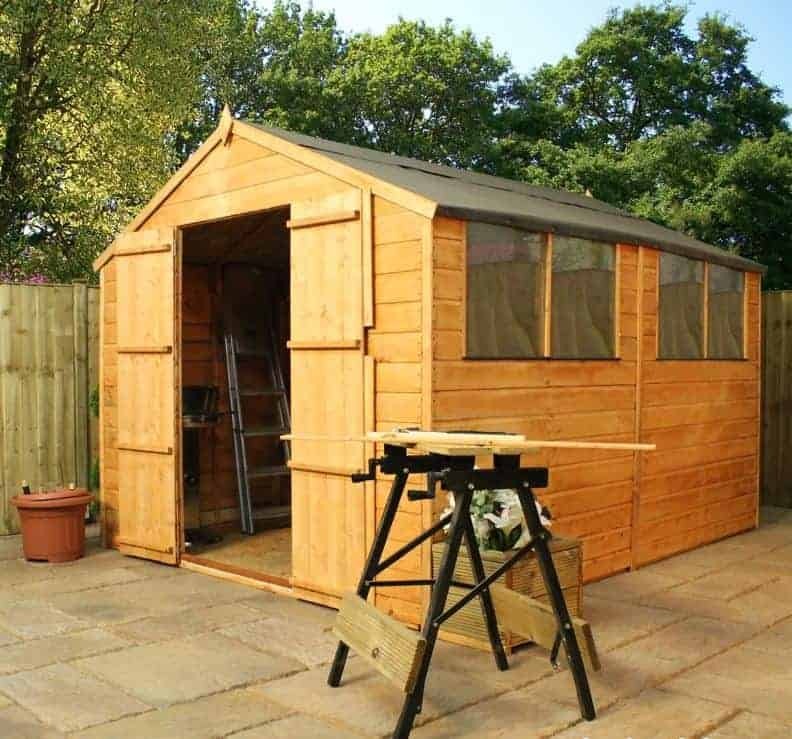 With a ten year warranty as well, which we feel could and should have been longer, this is a workshop shed with a lot to recommend it, but its extravagant price may put some people off, and it’s this that keeps it in the penultimate position in our WhatShed league table. The very best workshop sheds are strong, durable, and reliable, and these are certainly attributes that apply to this second Strongman model in our league table. 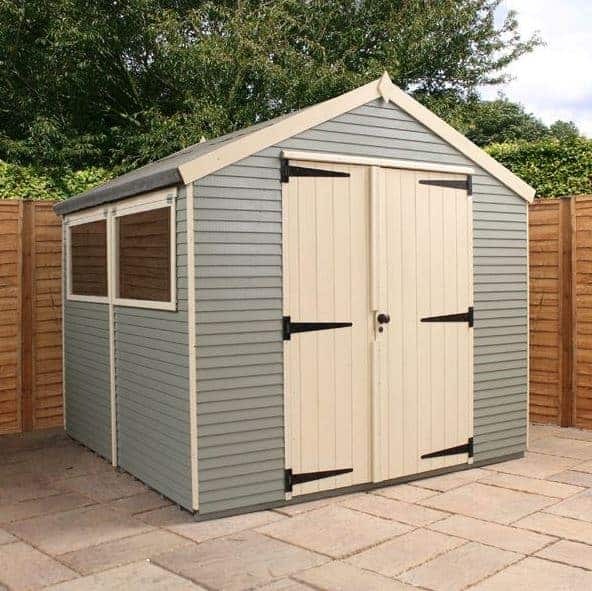 This is a much larger workshop shed, with a base area of 2.96 x 4.14m and it also has extra high eaves which as well as creating extra storage space would likely make it a very comfortable environment to spend time in. 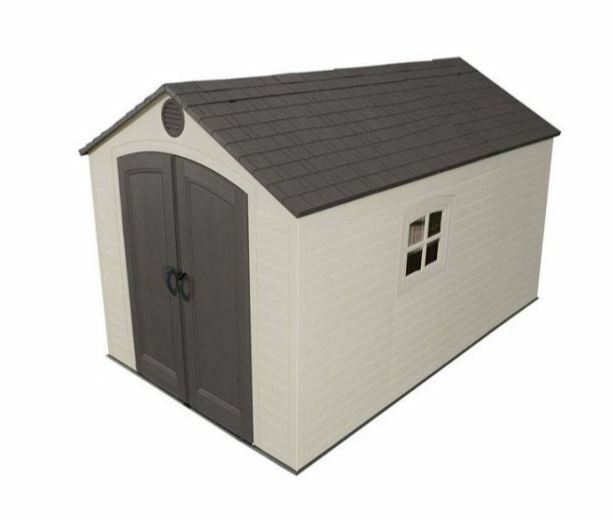 It is also, however, more expensive than many workshop sheds of a similar size we’ve reviewed, and despite being very tough and durable it doesn’t come with the long lasting warranty that we would have expected to see. It is for these reasons that it occupies the final position in our league table. We were pleased to find that tongue and groove cladding had been used throughout, and because it has a heavy duty frame it should feel very stable once the installation is complete. For this reason, we feel that this deserves consideration by those who are looking for workshop sheds that will stand up to the worst that our weather can throw at them. It should be noted, however, that this will also involve the customer having to add their own preservative treatments before or immediately after assembly, and every year thereafter.